We present an evaluation of five diffusion filters for liver vessel enhancement in 3D CTA datasets of the liver. 3D CTA liver images are generally noisy, with limited contrast between vessels and parenchyma, especially for the small vessels. 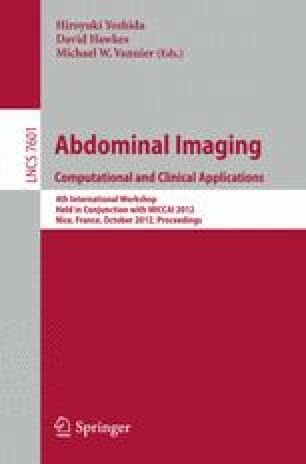 We investigate the performance of five (an)isotropic diffusions filters: Regular Perona-Malik, Coherence-Enhancing Diffusion, Edge-Enhancing Diffusion, Hybrid Diffusion with Continuous Switch and Vessel Enhancing Diffusion on a set of 14 abdominal CTA clinical datasets. The evaluation is based on signal to noise improvement. A parameter optimization is performed on 7 training images, after which the optimal versions of the filters are compared on 7 test images. The results demonstrate that all the diffusion filters improve SNR of the images and Hybrid Diffusion with Continuous Switch and Vessel Enhancing Diffusion gives the largest increase in SNR.